We’ve all been there: One minute you’re enjoying a leisurely breakfast, and the next, you glance at the clock and realize you only have 15 minutes to get ready and run out the door. What’s a woman to do? Certainly not skip her morning makeup routine! Rather than feel flustered and harried, use these makeup shortcuts to cut your prep time in half! You know you can’t skip your moisturizer, and you certainly don’t want to skip the skin-evening affect of your foundation, so when you’re in a hurry, your best bet is to choose a product that does both. Pick up a tinted moisturizer with SPF to help you achieve a flawless look in seconds. To maximize this makeup tip, look for a moisturizer with a little bit of shimmer – the shine will help illuminate your cheekbones while detracting from any skin imperfections. Tinted moisturizers are more forgiving than foundations, so you don’t have to worry as much about taking the time to perfect your application. The last thing you need to waste time on when you’re rushing to get ready is the hassle of pawing through a drawer of products to find the perfect lip color or eyeshadow. Yes, every woman needs options, but when was the last time you cleaned out your supply? Even if you can’t bear to part ways with any of your goods, set aside a few items to put in an “emergency bag.” Pick makeup that can do double-duty, like a bronzer or blush that can double as an eyeshadow or a neutral lip color that can be worn on the cheeks. 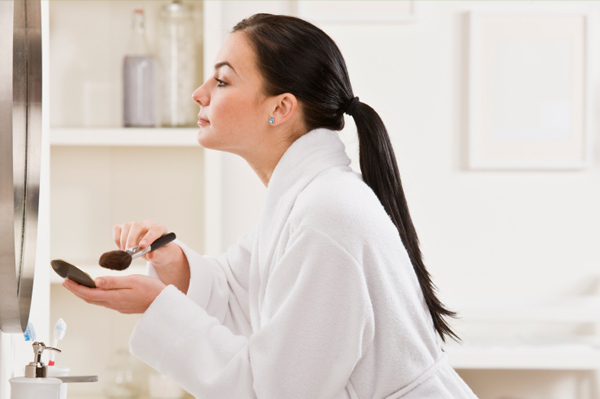 You’d be surprised just how much time you can save by taking the guesswork out of your beauty routine. It’s amazing how a little eyeliner and mascara can take a woman from just-rolled-out-of-bed to ready-to-hit-the-town in a matter of minutes. Nadine Luke, a senior makeup artist for MAC, suggests lining the upper inner eyelid rims with a black or brown liner. When you apply liner this way, the liner will transfer from the top to the bottom lid without straying outside the lid-line, effectively defining the eyes. After applying liner, give your lashes a quick coat of mascara to help make them pop. Even if you don’t have time to apply eyeshadow, the liner and mascara will help you achieve a pulled-together, natural look. Did you botch your eyeliner? Don’t worry about it! Just grab a Q-Tip and smudge the edges to give yourself a slightly sultry look. There’s something about glossy lips that looks “finished,” even if they only took a couple seconds. Rather than painstakingly applying lip liner and lipstick, gently bite your lips to give them a rosy tint, and then apply a shimmering lip gloss in a lip-matching shade. It’s best if you can find a gloss with lasting power, but you can always throw one in your bag to re-apply throughout the day.